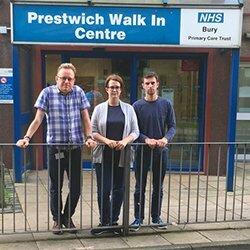 Councillors in Bury have been written to by Bury’s NHS Clinical Commissioning Group (CCG) informing us that the closure process of the Prestwich and Bury Walk-In Centres is now “paused”. At present the closure proposal, which had been agreed by the CCG, has been going through its formal consultation stage, but the CCG has announced that this consultation is “paused”. The delay is because the CCG wants to consider the announcement by the Government in the budget around how Urgent Care waiting times can be addressed across the country. At the moment is seems very unclear the impact of this “pause” will mean, but hopefully this will give us another chance to put the case that the Walk-In Centres are making a positive contribution to urgent care in Bury. We will keep you informed as things progress. Please get in touch if you have ideas about how we can work together to stop this closure. The email we have received is below. “The consultation on Bury’s proposed future model for urgent care is to be paused to allow NHS Bury Clinical Commissioning Group (CCG) a chance to consider a new directive aimed at improving urgent and emergency care nationally. Following the Chancellor’s Budget statement earlier this month, NHS England and NHS Improvement have jointly signalled urgent action now needed to turnaround urgent care performance during 2017. The new requirements highlight the need for ‘concrete changes’ to secure a more robust urgent care system throughout the country to overcome the difficulties experienced in previous winters. Whilst it is clear that many elements of the new directive are in line with Bury’s future proposed model; including better use of telephone triage, investment in evening and weekend GP appointments and GPs and nurses assessing and treating patients who do not need to be at A&E; further more detailed guidance on the requirements are awaited in the NHS Delivery Plan, which will be published in the coming weeks. It is appropriate for the CCG to review these new requirements to ensure that they align fully with our proposed future model for urgent care in Bury. As a result, the consultation on the proposed future model for urgent care in Bury will be paused as of 14th March 2017, collection of feedback via the online survey will be paused and the two planned public meetings will be postponed for the time being whilst the new and anticipated guidance is received and considered.